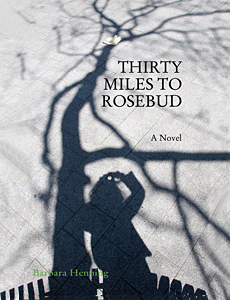 “THIRTY MILES TO ROSEBUD depicts a series of imploding families and fast interstates. Barbara Henning’s landscapes—a rust-belt childhood, a nearly forgotten East Village Bohemia and the arid Southwest streaked with the setting sun—are populated by runaways, lost loves and lifelong betrayals. In this remarkable novel, Henning’s eye for detail and her emotional honesty enables the past to loom in the rear-view mirror long after the car has sped by”—Donald Breckenridge. `Thirty Miles to Rosebud’ was a true pleasure. This is the first of Barbara Henning’s work I have read (and it won’t be the last). Usually I take my time. Not with this book. It pulled me in and forced me to read it virtually in one sitting and then all over again. Enthralling, captivating and thoroughly enjoyable, ’30 Miles to Rosebud’ really fired me up. The last time that happened in such an exciting way was with Cormac McCarthy’s “All the Pretty Horses”. One of my favorite writers is Annie Proulx. I now would put Barbara Henning right next to her in terms of sheer muscle as a writer, although both have their own unique style. It is unquestionably one of my favorite books of recent times. Henning is a stunning and brilliant writer. It is not really fair to compare her to other writers, because she has a natural, poignant style of her own that is at once deeply personal and richly descriptive and poetic. She evokes vivid imagery of scenery and nature, small towns and travel. Her personal introspective is filled with philosophical wisdoms of a generation that confronted the status quo and went on a quest for enlightenment–whatever that ended up being. We follow the heroine, Katie, as she journeys through life and wanders the land; along the way her intricate and interesting life unfolds. It’s all here: the Vietnam experience, the counterculture of drugs and attempts at personal and social liberation, social-change and the embracing of Eastern religion and practices–all of which seem so commonplace and almost ordinary today, but were so revolutionary and upsetting to society at the time. Katie’s story unfolds as an individualistic tale of emancipation, of breaking away from societal norms and the role of women. She reveals herself as a free-spirited soul, someone at once lost and still always grounded, someone in whom many readers will see reflections of their own experience, someone to relate to in a unique and personal way. It is very much a “boomer” story– set against a place and time of rebellion and “our time”–with all it joys and fallacies, it’s hopes and dreams and tragic disappointments and errors. This book continues where the great literature of the Beat and hippie generation left off. Barbara Henning should emerge soon as one of the great writers of our time. All she needs is a little luck…maybe a movie deal? Can someone please send this book to Oprah? A story of young love and the ensuing years of self-discovery in the 70’s and 80’s, Barbara Henning’s THIRTY MILES TO ROSEBUD is a narrative laid down in compelling layers, the scenes woven through a mostly lifetime search for an adolescent friend. The architecture of the book is formed of intra-chapter shiftings, transitions between Katie’s (the protagonist-author) runaway years, and her mature years. Plenty of harsh episodes blend into the sweet episodes of this memoir-novel written in a fine voice of first-person perspective. Shifting between rural and urban landscapes (Michigan’s UP, NYC, Mysore, India, New Mexico and Arizona), Katie’s search for her childhood friend revolves around a box of old photos and a journal of once-a-year entries by her friend’s mother. The contents of the box are the impetus which drives Katie’s quest for this phantom she pursues; and once found, a numbing encounter of betrayal awaits her delivery of the box.